I entered my culinary arena at 10 a.m. last Saturday and lost myself in batches upon batches of cookies, cakes and candies. When I finally came to, after a whirlwind day of stirring, mixing, and whisking, it was getting dark outside and I happily realized I spent the entire day in the kitchen. True, I was definitely proud of my accomplishments as I looked around my kitchen and admired my own work: freezer bags and Tupperware containers practically overflowing with holiday treats. But, I was also overcome with excitement as I imagined my confections wrapped in red and green paper, tied with ribbon. What was even more thrilling was the thought of them being eaten. 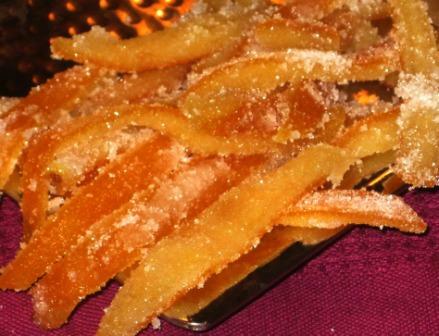 This recipe for candied orange peel is a sophisticated option to add to your cookie exchange, and even a little outside-the-box. Scrub the fruit to remove any waxy coating. Score each fruit into quarters and peel; reserve the fruit for another use. Put the peels in a saucepan, cover with cold water and bring to a boil for 1 minute. Drain the peels and cover again with cold water. Place a heavy heatproof plate on top to keep the peels submerged. Bring to a boil, reduce the heat to low and simmer for 30 minutes. Remove the pan from the heat and let stand until the liquid reaches room temperature. Reserve the water and set aside. Remove the oranges and, if the pith is very thick, scrape away the excess. Slice the peel into strips. In a 3-quart saucepan, combine the 1 ½ cups of the granulated sugar, corn syrup, and 1 ½ cups of the reserved water the oranges were boiled in. Bring mixture to a boil. When the sugar has dissolved and the syrup is clear, add the peels. Cook slowly until the peels are translucent, about 1 hour. Transfer the peels to a rack set over a tray to catch drips. Pour the remaining 1 cup of granulated sugar out onto a plate. When the peels are cool enough to handle, roll each in sugar to coat, then return it to the drying rack for 1 hour. Coat the peels a second time with sugar, and return them to the rack to dry for 1 hour more. To store, sprinkle the bottom of an airtight container with sugar, arrange the peels in a tight layer on top and sprinkle with more sugar. Arrange the remaining peels in layers, sprinkling with sugar between each layer. Cover and refrigerate. It takes quite awhile to take the oranges from their pure form to a candied, sugary version of their previous selves. Don’t let that discourage you from trying this, though – this is the ultimate recipe for multi-taskers. Many of the steps are actually repeated and entail plenty of time on the stove, which provides you windows of opportunity to make other goodies in between tasks. As the orange peels cook during their first two visits on the stove they soften and become pliable, beginning the process of making them easier to eat. You’ll notice the water the oranges are cooked in becomes infused with the citrus flavor and I felt it was just too good to pour down the drain. Though the original recipe called for 2 teaspoons of Grand Marnier to be mixed with plain water for the peels’ third trip to the stove, I seized the opportunity to re-use the cooking water instead. It combines with the sugary solution and, since the peels have already been softened, injects its flavor back into every strip of the fruit. The extra coatings in granulated sugar transform the once healthy citrus fruit into a festive holiday treat. To really dazzle those who will be enjoying these goodies, dip one end in melted chocolate; at the very least it provides a spot to pick them up without getting sticky fingers. Save for the few I sampled, and the several Joe snuck (he swears they taste like gummy worms for grown-ups), these will be part of the Christmas care packages I’m making. The only thing better than gloating about how many dozen cookies I made, how many varieties of treats I produced, or even my clever wrap-job is watching the recipients enjoy them. In my opinion, the best gifts are the ones you can eat.